The Mercury XU5 SoC module from FPGA specialist, Enclustra, is based on the Xilinx Zynq UltraScale+ MPSoC. It features six Arm cores, a Mali 400MP2 GPU, up to 10Gbyte of extremely fast DDR4 SDRAM, numerous standard interfaces, 178 user I/Os and up to 256,000 LUT4 equivalents. Two independent storage channels achieve memory bandwidths of up to 24Gbyte per second. The Mercury XU5 MPSoC module features more direct interfaces to the FPGA fabric, in addition to a Gigabit Ethernet connection as well as up to 2Gbyte DDR4 SDRAM. The module has dimensions of just 56 x 54mm, has up to 8Gbyte DDR4 ECC SDRAM connected directly to the processing system, 16Gbyte eMMC flash memory as well as standard interfaces, such as Gigabit Ethernet, USB 3.0, a display port, SATA and SGMII. Both the processing system and the FPGA matrix have four PCIe Gen2/3 connections. 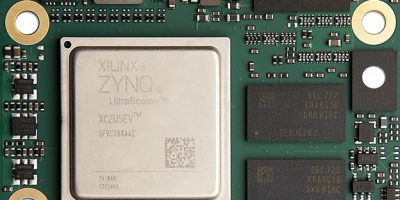 The Xilinx Zynq UltraScale+ MPSoC is manufactured in a 16nm FinFET+ process and comes equipped with six Arm cores – four 64-bit Arm Cortex-A53 with a clock rate of up to 1333MHz as well as a 600MHz 32-bit Arm dual-core Cortex-R5. The processors are supported by a MaliTM 400MP2 GPU and a H.264/H.265 video codec (EV variants). The accompanying Mercury PE1-200 baseboard, the Mercury XU5, is a powerful development and prototyping platform. Further expansion options are provided by the LPC FMC connector on the PE1 base board, which is compatible with a range of plug-in cards from various manufacturers, including ADCs, DACs, motor control cards and RF links. Enclustra’s ecosystem for the XU5 includes hardware, software and support materials, together with detailed documentation and reference designs, user manual, user schema, a 3D-model (STEP), PCB footprint (Altium, OrCAD, Pads, Eagle) and differential I/O length tables. The Enclustra Build Environment can be used to compile the Enclustra SoC modules with an integrated Arm processor. The module and baseboard are selected by a graphical interface. The Enclustra Build Environment downloads the appropriate Bitstream, First Stage Boot Loader (FSBL) and the required source code. Finally, U-Boot, Linux and the root file system are compiled. The use of compatible connectors, means different types of modules can be used on the same base board. If, for example, an Arm processor is not required, the Mercury KX1 FPGA module can be used on the same baseboard instead.